A common prerequisite for coral propagation and population enhancement is the establishment of nurseries that can supply large numbers of corals of a size that can survive and grow at the site to be restored. Coral nurseries are a critical component of this process because they supply coral colonies without causing major losses to wild populations. Field-based, or in-situ, nurseries are currently the most common method used to raise corals. These nurseries follow the general process of collecting stock material from wild populations on nearby reefs and growing them to a size suitable for nursery expansion and/or outplanting back to the natural reef. Once established, in-situ nurseries can contain a stock supply of corals that can be used for future population enhancement projects. There is no “one size fits all” approach to coral nursery design. A diversity of structures and designs have been employed successfully around the world and are dependent on the resources available, typical environmental conditions, permitting regulations, and nursery site characteristics. Before investing resources on a particular design, it’s advised that a pilot, or test nursery be created and used to evaluate site and structure effectiveness before scaling up to a larger nursery. Pilot projects can help avoid or minimize unplanned and unnecessary losses to a restoration program. Field-based coral nurseries have many advantages, particularly their relatively low costs and low technology methods. Although these nurseries can require large investments in time, less skilled or experienced personnel, such as volunteer divers or local citizens, can help offset these costs. Field-based nurseries are more susceptible to environmental extremes like warm temperatures or strong storms that can damage nursery corals and structures. Thus, nursery size, location, depth, design, and structure are important factors to consider when planning and designing your nursery. Best practices that can maximize coral colony and nursery program success are outlined below. Protection from disturbances – such as storms or heavy wave surges, large temperature fluctuations, coastal construction, or other factors that can cause physical damage to corals. This can be achieved by placing a nursery in a well protected area, such as in deeper waters (that are still within the normal species depth range) or away from permitted coastal construction activities. Protection from competition and predators – such as predatory snails, worms or starfish, coral disease outbreaks, or high levels of macroalgae, sponges, or fire coral that cannot be maintained or managed. Bottom type – sandy, rubble, and hard substrate areas may all be suitable for rearing corals but depend on the specific rearing structures used. For instance, floating structures may be better in sandy environments to reduce sedimentation stress on corals. Environmental Conditions – including light availability, water temperature, water movement, salinity, sedimentation and turbidity. It is generally suggested that nurseries be deployed at depths and in conditions where the coral species being reared is typically found. Each of these factors can affect colony growth, survival, and health to varying degrees. Water quality – water quality should be suitable for coral growth. Nurseries should ideally be away from land-based sources of pollution, sewage, freshwater, or sediment discharge. These conditions will likely decrease the chances of disease and stress-related mortality. In addition, nursery maintenance could also be affected by water quality, especially if poor water conditions increases algal overgrowth. Human activities and impacts – should be minimal in the nursery site, for instance by placing the nursery in a marine protected area (MPA) that is free from fishing pressure and damage. However, it is important to consider how many divers or boats will be visiting or near the site, which can cause damage or restrict access for nursery-related activities. Site accessibility – this is a key consideration to ensure that nursery personnel can easily get to the site to deliver materials, transport corals to and from nearby reefs, and conduct routine maintenance and monitoring. 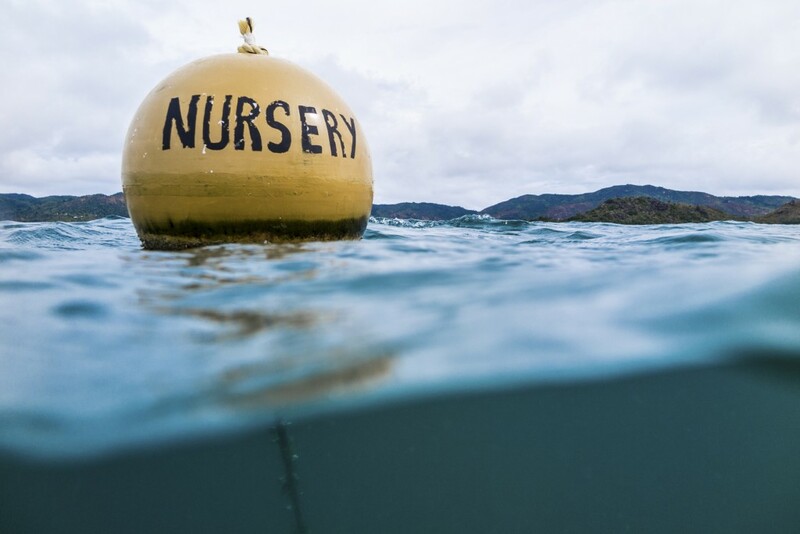 Placing nurseries in shallow areas close to home base can increase accessibility to nursery operations and also minimize fuel and diving costs. Size of the nursery – available time, budget, and program goals are important for determining the size of a nursery that will be manageable. During the planning phase, keep in mind the possibility to expand the nursery, however with expansion comes the increase in monitoring, maintenance and number of corals to outplant. Permitting – in some locations, permitting requirements restrict where a nursery can be placed. Practitioners should work in collaboration with local management agencies to obtain permits and select sites that are appropriate for rearing corals that avoid conflicts with other uses and activities. 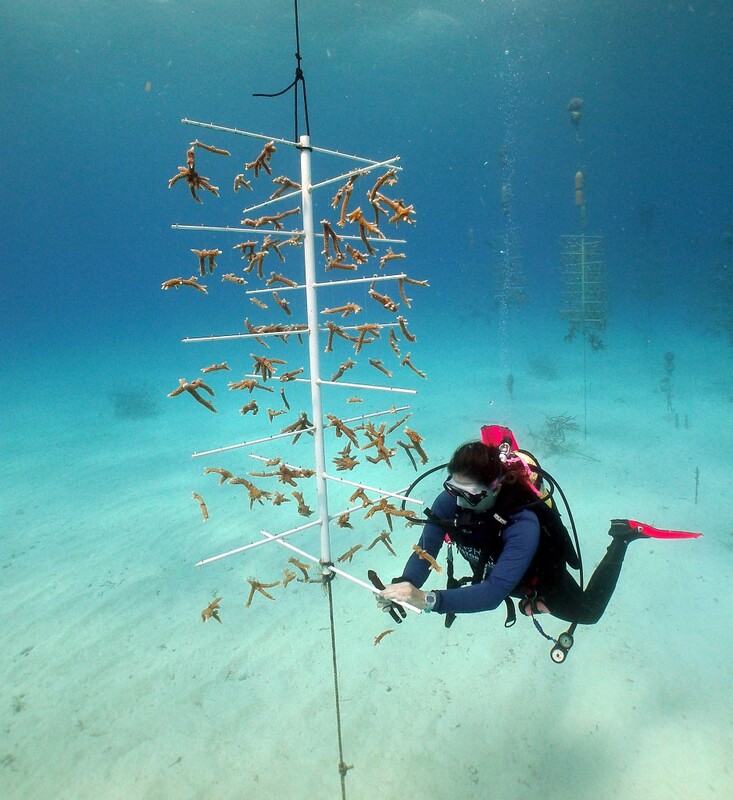 Many structures have been used in field-based nurseries to secure and grow coral fragments. There are two main types: floating (suspended in the water column above the seafloor) and fixed (located near or on the seafloor). Each method has advantages and depending on resources, nursery access, and coral species being cultivated. Below are the most common nursery structures, summarized from the Caribbean Acropora Restoration Guide. If frequent maintenance cannot occur at your nursery, floating structures will not be the best option as coral growth and overgrowth can cause structures to sink and damage the corals. Floating nursery practitioners need to be aware of vessel traffic and not create a nursery that will be a hazard to navigation. Entanglement or coral damage by anchor lines may occur in areas with high boat traffic. Floating structures must be constructed in a manner that reduces the likelihood of entanglement with other marine life, such as sea turtles or marine mammals. For instance, line nurseries should have horizontal or vertical components that are rigid (e.g., made of PVC) to prevent the structures from collapsing and creating loose lines that are difficult for an animal to escape. Keeping structures at least 1 meter above the seafloor reduces predation and sedimentation during periods of high wave energy. If nurseries are built in an area where bleaching is a concern, nursery structures can be lowered during high temperatures to reduce the likelihood of bleaching. This same concept may be applicable for high energy conditions such as storms, although lowering too much may have a negative effect due to the sand movement. Block nurseries may be the best choice for shallow water nursery environments or areas where floating structures may be a navigational hazard. Benthic structures must have sufficient stability to avoid being moved by storm waves. This can be done using weights or anchoring systems such as Duckbill or Helix anchors or rebar driven into sediment. Caution should be taken to avoid or minimize damage to natural reefs or other habitats. Sufficient space should be left between blocks to allow for divers to maneuver between them for routine monitoring and maintenance without causing damage to corals. Block and coral locations on the rearing structures should be mapped to increase efficiency and reduce data collection errors. The number and spacing of corals secured to blocks should be determined based on the size that coral fragments will grow before being fragmented again. Overcrowding of corals on blocks should be avoided as this can reduce coral growth and branching. 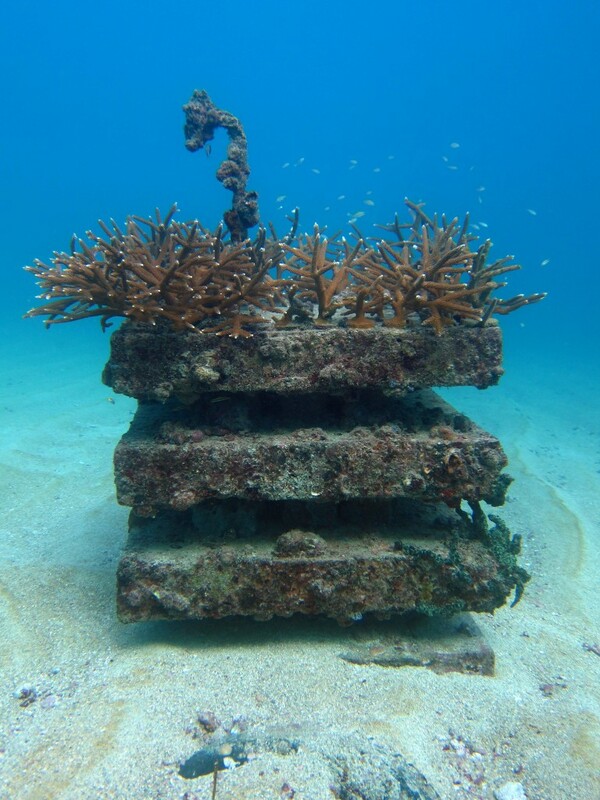 Concrete nursery module used for raising Acropora cervicornis in an in situ nursery. Photo © Elizabeth Goergen, NOVA Southeastern University. Similar to block nurseries, frames should be spaced within the nursery to allow easy access for divers to conduct routine monitoring and maintenance activities. Spacing should also allow for nursery expansion if needed. The spacing of corals on frames should be far enough apart that corals can grow without overcrowding before the next fragmentation event. Leaving empty space on the frames is advised if sequential fragmentation is going to occur. Spacing between corals also allows for easier cleaning of the frames. Corals on the frames should be well above the seafloor to reduce coral predation, sedimentation, or other stressors. Frame mesh size can affect coral fragment survivorship. Smaller mesh sizes can provide more attachment points for corals, but also tend to be colonized more frequently by damselfish. A mesh size of 10-15 cm is advised to reduce mortality due to damselfish while also providing sufficient attachment points. 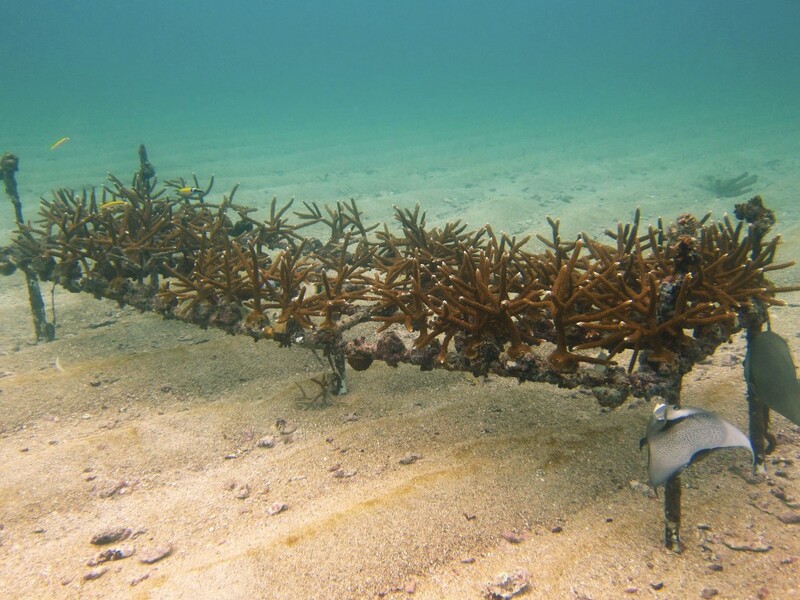 If in high energy environments such as areas with frequent storms, PVC arrays may not be the best option since the flexible but still rigid structure of the PVC can cause corals to fragment and become dislodged more frequently than other structures during storms. 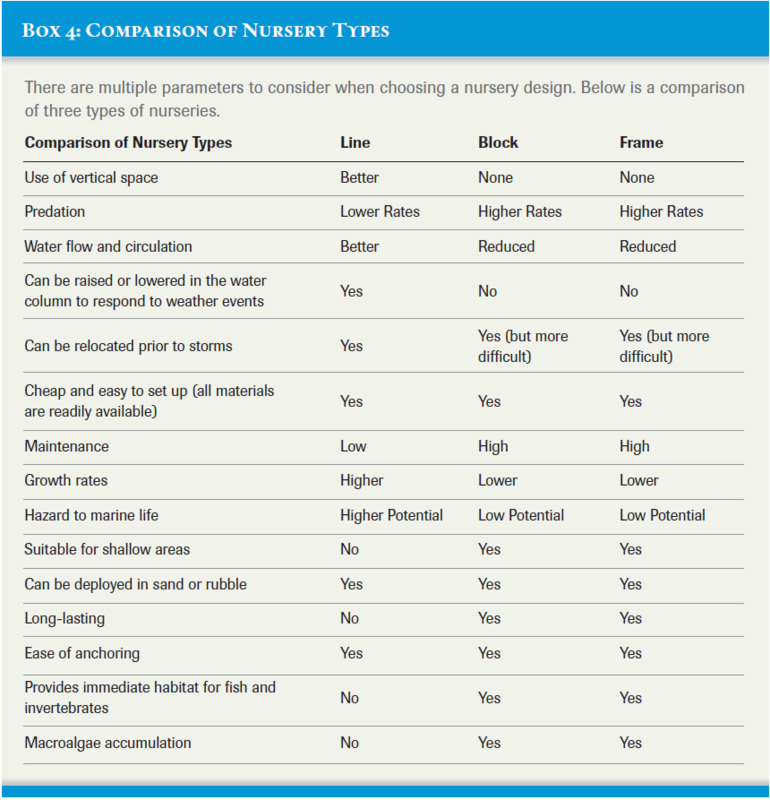 Below is a comparison of advantages and disadvantages for each of these nursery types (Caribbean Acropora Restoration Guide, pg. 16). Routine monitoring and maintenance of field-based nursery structures and coral fragments is a crucial step in maximizing coral productivity and nursery operations. Since maintenance activities do not usually require extensive knowledge or skills, these activities can be used to engage local communities. Several well-established nurseries train volunteers, recreational divers, or local fishermen during the off season to help with nursery maintenance. Common nursery maintenance and coral fragment monitoring activities are outlined below.